Veterans For Peace Chapter 92 in Greater Seattle is represented by the ACLU of Washington in suing the city of Auburn for the right to participate in this year’s Veterans Day Parade. Veterans For Peace chapters are participating in events on or around this November 11th in over 50 U.S. cities, many of them honoring the tradition of Armistice Day, the earlier name for what is now called Veterans Day. 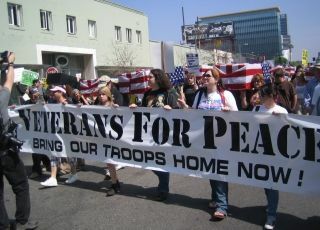 Veterans For Peace has participated in the Auburn parade every year since 2006. Auburn rejected VFP’s application to march in the parade this year, saying that other applicants more closely met the parade’s goals and purpose. Among the applicants accepted are a motorcycle club, a Corvette club, the Optimists and Kiwanis International, the Sons of Italy, and a Daffodil Festival float. The suit asserts that the City of Auburn is discriminating against Veterans For Peace because of the group’s viewpoint, and seeks a court order to allow VFP to march.